Technology is an amazing thing. If you take a minute to think about all of the technological advances that have taken place in the past 15 years, you’ll remember that things today are a lot different than they were in in 2004. Cell phones now double as tiny computers. The need to purchase disposable cameras (or own a separate, snap-and-click digital camera) is long expired. Suffice to say, it shouldn’t be surprising to anyone that thermostats have also experienced some technological advancements. If you’ve been researching the benefits of installing a smart thermostat in Longmont, CO, you may be leaning toward the install. For this blog, we wanted to talk about some of the benefits that are associated with this technology. We all know a friend, family member or coworker who, at some point, went on vacation and forgot to turn the thermostat down. Maybe this happened in the winter, and the furnace was set to keep the home at a pleasant 72 degrees while the family was gone for two weeks. Maybe this happened in the summer, and the AC was running at full blast during an extended 4th of July break. Either way, this type of mistake can be expensive. When you choose a smart thermostat, you’ll be able to link the device to your smart phone. If you’re worried that you forgot to turn the temperature up (or down), you can check it from your phone. If adjustments need to be made, you can do that from your phone, too. Another benefit of this, is that you’ll be able to pre-set your home’s temperature before you return from your trip. If you’ve left for a long weekend and you’ve turned the temperature down, you’ll have the peace of mind that comes with knowing you can turn the furnace back on before you get back. In addition to being able to monitor and set the temperature from your smart phone, you’ll also get real-time data about how well your HVAC is functioning. If your energy usage is starting to inch upward for no apparent reason, you’ll have access to that information before your next utility bill. This will allow you to schedule a maintenance appointment, before your heating or cooling bill has a chance to get out of hand. 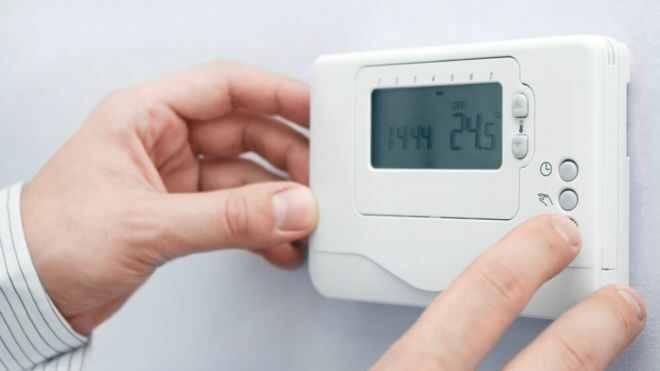 If you have additional questions about the benefits of smart thermostat technology, call Comfort Pros today to speak with a heating and cooling expert you can trust. If you’re ready to move forward with an install or you would like more information about the pros and cons of different systems, call us now to get started.